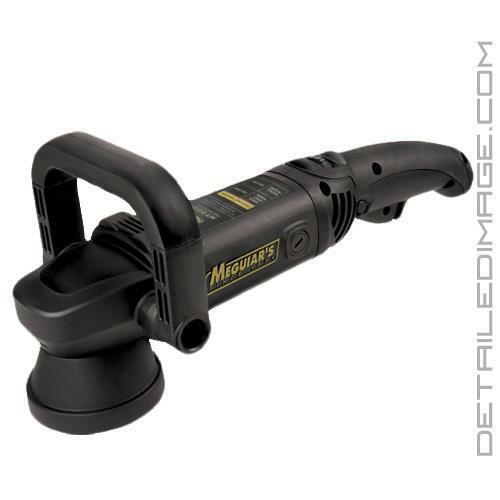 The Meguiar's MT300 Dual Action Polisher is designed by professionals, for professionals. From the lightweight, ergonomic form, to the billet counter weight with multiple bearing design, to Meguiar's Digital Torque Management speed control, this buffer really has the features to stand out to both professional detailers and weekend warriors alike. The MT300 features a soft start for easy control and a 3000 - 7500 OPM variable speed control. MT300 will sense pressure and reduce power when too much pressure is applied to help reduce any risk of harming the paint. This Digital Torque Management system ensures proper torque to help maintain load speed and provide you with outstanding results. The 8mm throw is great for compounding, polishing and waxing on both large surfaces and in those tighter to reach areas. The MT300 does not come with a backing plate, but the Meguiar's Soft Buff DA Backing Plates are a perfect fit! If you are looking for a great all around polisher, the Meguiar's MT300 Dual Action Polisher is a great choice! Note: Does NOT come with a backing plate. Recommended use with the Meguiar's Soft Buff DA Backing Plate.